Chrysler Lender Attorney "White House Directly Threatened My Client"
Beckman: So what’s the matter with your vulture clients who are so greedy and selfish. Why won’t they go along with this? Lauria: Well, they bought a contract that says that they get paid before anyone else does by Chrysler. And they have been told by the government who is in complete control of Chrysler, oddly enough, that despite their contractual right, they do not get paid before everyone else. So they are standing on their rights, standing on the law, trying to defend in effect what is the Constitution of the United States, to make sure that they get what they’re entitled to for their investors. Beckman: Tom, let me make the argument against you in another way. We’ve heard the President say this, "I wouldn’t want to stand on their side." Ron Gettelfinger says "Everyone else has made concessions. These people won’t; they’re greedy." Why not take a concession that is being asked of everybody else and is being accepted by everybody else, including other hedge funds that had bought some of these bonds in Chrysler? Lauria: Well that’s a great question, because let me tell you it’s no fund standing on this side of the fence opposing the President of the United States. In fact, let me just say, people have asked me who I represent, and that’s a moving target. I can tell you for sure that I represent one less investor today than I represented yesterday. One of my clients was directly threatened by the White House, and in essence compelled to withdraw its opposition to the deal under threat that the full force of the White House press corps would destroy its reputation if it continued to fight. That’s how hard it is to stand on this side of the fence. Lauria: Now let me just tell you, to be clear, that we do not oppose the rehabilitation of Chrysler. We think it is vitally important that a company like Chrysler be protected to the extent that it can be within the framework of the law. I want to also say that we do not oppose the government backstopping or supporting the pensioneers and retirees and workers of Chrysler. I actually think that in a troubled economic time like we’re in, that is an appropriate role for the government to perform. What we do oppose, however, is the abuse of the bankruptcy law to coerce first-lien lenders subsidize the rehabilitation of Chrysler or the backstop of the obligations to the pensioneers and retirees beyond what they will do voluntarily. And just to be clear, these clients of mine have agreed to compromise 50% of their first-lien position to help support the rehabilitation of Chrysler — Contrary to what the President said yesterday in his new conference that "these people will not give to support the effort," they have agreed to compromise 50% of what they’re owed to support the rehabilitation of Chrysler, despite the fact that they’re under no obligation whatsoever to do so. That is what we stand for, and that is what we’re going to go to court to fight for. Beckman: OK, so they have offered to take 50 cents on the dollar. What are they being offered in return, and how does that compare to what other stakeholders, say the UAW, are going to be receiving? Lauria: Here’s the troubling circumstance here. My clients bought a position in the Chrysler capital structure that entitles them to be paid "first dollars out." That is, they’re to be paid 100 cents of what they’re owed before any junior creditors get a penny. The government has offerend them 29 cents on the dollar, in the context of a restructuring of Chrysler that will send over $10 billion of value to junior claims. And when I say $10 (billion), that’s a floor. As we’re continuing to review the papers that Chrysler has filed in the bankruptcy court, that number may actually be more like $20 billion. So in other words, my clients, who are contractually entitled to 100 cents on the dollar, are being asked to take 29 cents on the dollar, while junior creditors are being offered somewhere between $10-$20 billion of value in the Chrysler rehabilitation. Now I ask your listeners, what would they do if they were in our position? Peter A. Weinberg and Joseph R. Perella are part of a band of Wall Street renegades — “a small group of speculators,” President Obama called them Thursday — who helped bankrupt Chrysler. That, anyway, is the Washington line. In fact, Mr. Weinberg and Mr. Perella, with sparkling Wall Street pedigrees, are the epitome of white-shoe investment bankers. And their boutique investment bank, a latecomer to Chrysler, played only a small role in the slow-motion wreck of the Detroit carmaker. As Chrysler’s fate hung in the balance Wednesday night, this group refused to bend to the Obama administration and accept steep losses on their investments while more junior investors, including the United Automobile Workers union, were offered favorable terms. Chastened, and under intense pressure from the White House, the investment firm run by Mr. Weinberg and Mr. Perella, Perella Weinberg Partners, abruptly reversed course. In a terse statement issued shortly before 6 p.m. Thursday, Perella Weinberg Partners announced it would accept the government’s terms. What attorney Tom Lauria describes is nothing short of chilling. Obama is on the side of the Unions in this and forget about anyone else. His heavy handed deal and threats like this are a disgrace and he is a disgrace. Mark Levin and Rush too were talking about this on their shows. "these people hold investments of average people. It's not these two guys single-handedly putting their own money into Chrysler and extending debt to Chrysler. It is people who invested with them. So it's not just these two guys that are going to lose; it's everybody who invested with them, and yet they are portrayed as the villains! Obama favored the UAW at the expense of the bondholders. I vote that the big banks rolled over 'cause they're scared to death because wherever I go, I don't care who I interact with, they're scared to death of this administration. There is genuine fear of the government from average Americans buying up guns and ammunition like they never have before, to people on Wall Street, to big businesses, there is abject fear. So I vote for number three. We'll never really know. What we do know is that Obama got angry at the holdouts. What we have here is a new Fairness Doctrine, the Obama Fairness Doctrine. Didn't need Congress, didn't need the courts for this. It's not about radio, it's about everything. Here's the scenario. Obama listens to all sides, and all sides end up thinking Obama understands and agrees with them. Obama, after listening to all sides, then plays Solomon and pronounces what's fair. And if you don't accept his fairness -- he-he-he -- you are dispatched to Messiah Park, not Fort Marcy Park, you are dispatched to Messiah Park. Sure, of course the listing is just an exercise. He's got his mind made up. He brings these people in the room just to do a snow job on them to make them think they've got a chance at changing his mind. That's why he had dinner with the conservative columnists. It's all for show; it's all PR. This guy is a committed ideological, liberal leftist who's putting on a show for everybody. " 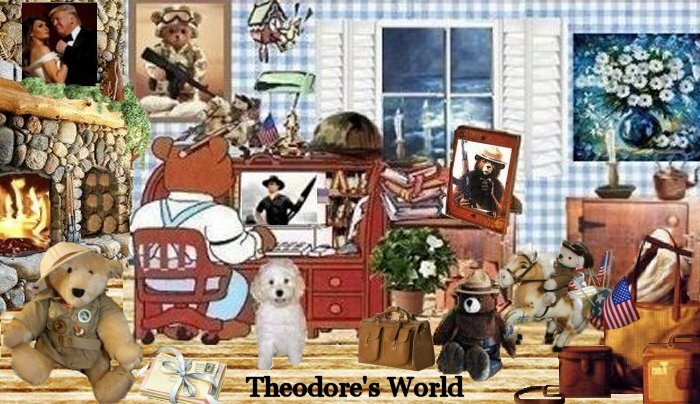 You are viewing an individual category archive page at The PC Freeze from Theodore's World.